The heroes of action films always make it look so easy. Need to climb a tall building? Simply fire a grapnel hook from a handy harpoon gun, it’ll always land exactly where you want it and gain a perfect purchase so you can shin up the rope and arrive at the top barely having raised a sweat. If Hackaday ran Q Branch, we can tell you, we’d make ’em work a bit harder. If only because nobody likes a smartass. If you’ve ever had to get a real line over something tall, you’ll know it’s a lot more difficult than that. You can only make it work with the lightest of lines that you can then use to pull up something more substantial, and you would be amazed how poor a thrower you are when you’re trying to throw upwards. Try attaching fishing line to a weight, try a bow and arrow, and nine times out of ten you won’t make it. There’s a serious amount of skill and luck involved in this line-throwing game. [WB5CXC] has an interesting solution to this problem, at least as far as the application of throwing antenna wires over tall obstacles. 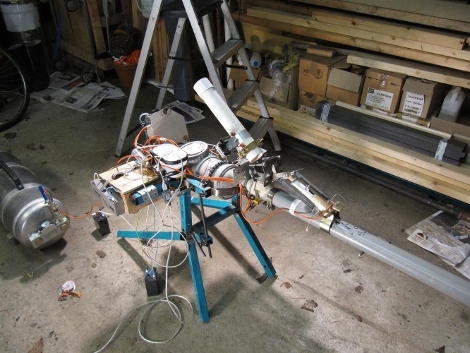 He’s made a spud gun from PVC pipe, powered by compressed air. It takes the form of a U-shaped tube with one side of the U being a pressure vessel separated from the other by a ball valve.. Place a close-fitting puck with your wire attached in the open side with the valve closed, pump the pressure vessel full of air with a bicycle pump, and open the valve to send both puck and wire skywards. He says it will clear 100′ trees, counsels the user not to go higher than 100psi, and warns that the speeding puck can be dangerous. We like it already. We’ve covered many spud guns here at Hackaday in the past, but it seems this is the first wire launching one. We’ve had a steam one for example, or this bolt-action spud gun, but pride of place has to go to the spud gun to end all spud guns. This vacuum pressure cannon is a design unlike any we’ve seen before. At first look it seems to have the components you see in a potato gun. But those use a combustion process to launch the projectile. This instead uses the sudden release of a vacuum. About three minutes into the demo video below we get a look at the “ignition” system. It’s pretty scary in that a couple of really powerful springs are pulling a collar along the barrel toward your face. This is actually meant to dislodge the plug in the back which is holding vacuum in the barrel. The pressure difference causes a sudden inrush of air which shoots the 1.5 inch projectile out the front of the bazooka. [Mr. Teslonian] built his own hand powered vacuum pump for loading the weapon. This was done with a pair of PVC pipes that fit inside of one another, and a plunger made from wood and leather. The PVC and wood projectile seals in the barrel using a skirt made from duct tape. After breech loading the projectile and plugging the back of the barrel, he layers aluminum foil over the business end and pumps up a high vacuum. His test firing is not from the shoulder, and he only gets one shot because the slug hit the target so hard it was destroyed. This thing really needs to be vehicle mounted! We’re a long way from the Aquanet-powered plastic pipe spud guns of our youth. [smirpab] over on the SpudFiles forum posted a work in progress of an amazing replica AS50 sniper rifle he’s building. This pneumatic cannon goes above and beyond any air-powered rifle we’ve seen with an Arduino that is able to switch between automatic, semi-automatic, and burst modes with an LCD display and a rate of fire control. The mechanics of [smirpab]’s build are fairly normal for this level of pneumatic gun; it shoots 6mm plastic pellets from a smooth bore barrel with using air compressed to about 10 bar (145 psi). 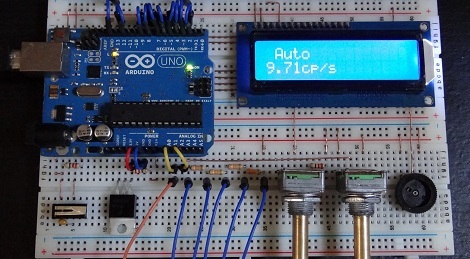 The electronics is where this project really shines, with an Arduino controlling the mode of fire (auto, semi-auto, and a 3-round burst), and the number of rounds per second adjustable with a pot. A very cool project, and looking at the CAD renders of what [smirpab] completed project will look like, we can’t wait to see this build finished. As always, this build comes with the standard Hackaday “you’ll put your eye out, kid” warning. You can check out a video of [smirpab]’s piston after the break, along with a demo of the Arduino-powered control circuit going through all three firing modes. In Norse mythology, Mjöllnir is the hammer of Thor, forged in a contest to create the most wondrous and munificent tool for the gods of Asgard. While we’re not aware if [MrCrowley] recently made a bet with Loki, his version of Mjöllnir, a gigantic spud gun powered by MAPP gas, is wondrous enough for our tastes. Unlike most of the other spud guns we’ve seen, [MrCrowley] eschewed the use of PVC pipe and fittings in his build because that would explode on the first test fire. Instead, the gun uses galvanized and stainless steel for the majority of the construction. That’s not to say this spud gun is necessarily safe, though: as he demonstrates in the video after the break, golf balls exit the barrel with a comparable energy to most rifle rounds. For an interesting take on an ignition system, [MrCrowley] built a remote ignition system out of a wireless doorbell and a 100kV stun gun. While this does allow for remote firing, the entire build seems safe enough – from behind the muzzle, at least – to be carried with a rifle strap. It should go without saying that this is incredibly dangerous and you shouldn’t build this if you’re not planning on your last words being, “Wanna see something cool? Hold my beer.” That being said, [MrCrowley] knows what he’s doing, and you can check out the video of Mjöllnir in action after the break. There’s nothing quite like [Elliot]’s cherubic sense of wonder and maniacal laughter after he tests his fully automatic AA battery-launching air gun. That fires 600 rounds a minute. At 200 feet per second. We need to take a minute and say [Elliot]’s gun is stupidly unsafe. He used PVC pipe to hold air pressure, so that may… explode one of these days. Also, the AA batteries coming out of the end of the barrel have the same kinetic energy as a .22 rifle bullet. The mechanics of the gun is a simple blow forward bolt. When he pulls the trigger, the bolt – and battery – are forced forward due to air pressure. After the bolt has cleared a plug, air is allowed to flow through the bolt pushing the battery along with it. Once the pressure in the barrel is back down to normal, a spring forces the bolt back into place and the 23 round magazine loads another battery. Simple, really. [Elliot] posted some pics of his gun on the spudfiles.com forum. The gun is accurate to about 100 yards. It’s a very impressive piece of engineering for a bit of PVC pipe, but we don’t feel the need to copy this one. Check out the videos after the break to see this thing in action. As an amateur radio enthusiast, [Andrew] sometimes has to set up impromptu antennas up to 160 meters in length. The easiest way to get these antennas off the ground is to drape them over trees, a feat normally accomplished by lofting fishing line into the air with a slingshot or bow and arrow. [Andrew] thought slings were so last century, so he came up with a spud gun inspired antenna launcher. The launcher is built out of PVC and launches a foam filled tennis ball that can reel out 150 yards of Spectra line. In a moment of brilliance, [Andrew] decided to add an augmented reality HUD. The display is actually [Andrew]’s phone running an app called Geocam that provides him with a display of elevation and azimuth overlaid on the phone’s camera feed. The results of [Andrew]’s build are fairly impressive. The cannon was able to lob a tennis ball over a 110 foot tree at half the pressure rating of the PVC. The grouping was pretty tight as well, more than sufficient to run a line over a tree. [Andrew]’s antenna cannon is an awesome piece of work and unlike most french fry cutters, it’s a useful tool. If you’re interested in seeing 160 meter antennas heaved over the tops of trees, amateur radio field day is next month week, June 25th and 26th. If you get in the line of fire this golf ball launcher is gonna leave a mark, or worse. It’s based on the same premise as the sausage gun, but now everything is automated and no meat products are used. A hopper stores a row of golf balls. When it comes time to load, a ball falls into the chamber, starter fuel is sprayed into the combustion area with the aid of a fan, and after both chambers are sealed the propellant is ignited.